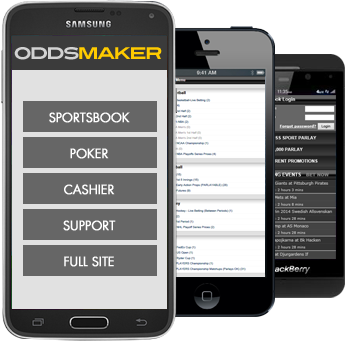 Go to Oddsmaker.ag with your Mobile Device. You will automatically be redirected to our OddsMaker Mobile Site. Access your OddsMaker account directly from your iPhone, iTouch, iPad, Android and Blackberry by using your internet browser. Bet on sports, Play Online Poker, Play your favorite Casino Games, Redeem your Players Club Points, check pending wagers and view your wagering history, with the swipe of your finger.